Another Book Club, yes it's true. For those of you who followed my BEA posts from this year, you know that I really wanted to meet Ice-T and his wife, Coco at the Autographing Events. I just made it in time to get a few far away pictures but I was unable to get a ticket to meet them. Thanks to a fabulous fellow from Random House, I was at least able to get a copy of Ice's book to read and review. I probably would have lost the one ounce of cool I have anyway, if I would have met him. My husband is a huge fan as well and asked, in all seriousness, if I could smuggle in a copy of the CD OG: Original Gangster to get signed. Me, in all my book nerd glory, clutching a crusty old copy of "one of the greatest rap albums ever!" (According to my husband). What a sight! I would have done it though, darnit! Because of his respect for all things Ice, he snagged the book before I could. So, today's review, is brought to you by one of my awesome Guest Reviewers, Sean; The Husband. OK, first off, I gotta say; this was the single best memoir I've EVER read. 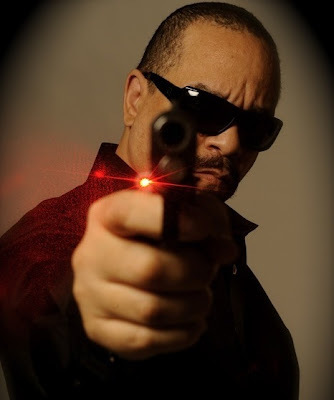 Mostly because I have followed his career for a couple of decades and of the many OG Hip-Hop artists on the scene back in the day, Ice-T was always one of the most outspoken, honest, no holds barred players represented by a major label. Sire (Warner Bros.) took a huge leap of faith with him, and when adversity hit; record sales alone were not enough to keep the PMRC off his back, so like the gentleman he is, he volunteered to opt out of the contract, thus saving WB (and himself) some face. 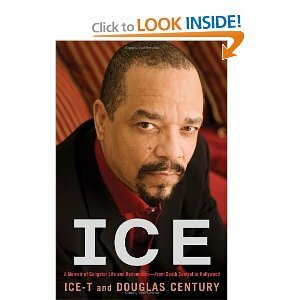 This book explains all this, and pretty much anything else you could ever want to know about this remarkable man; in a voice undeniably Ice-T. The writing flows like freestyle spitting, with just enough verbose terminology to legalese ratio. Obviously, this guy has been around lawyers long enough to be 100% legit, while still throwing some mad game. This book is a window into the soul of one of the most enigmatic rappers of the 20th century, and I think should be recommended reading for any young adult / music industry aficionados, or even students of philosophy/ cultural anthropology. It is so refreshing to read a memoir that basically states "Yo, I was stupid, and here's why." complete with an index of 50 "life lessons" in the back that summarizes his life experiences in an easily digested form. HIGHLY recommended. What a passionate review! Thanks Sean! And thanks, once again, to Tom from Random House for sending me a copy of this book. Now that was a hot review. I have 2 guys that would love this also. Ice T back in the day definitely had a lot to say and interesting. I can tell your hubby is a true fan. Wow, great review from your husband - very enthusiastic! I never listened to Ice-T. I think he was before my time, but this sounds like a good book. Love his enthusiasm for this one. I miss the overt social and political commentary of early rap, Ice-T and N.W.A. were the best. Sounds like a very interesting read. I love that you got a musician to review the book too, Sean presents a different viewpoint for us non-musically talented readers! Great review! My husband is a big rap fan...of Ice T and NWA. I like some rap, but I'm not as fanatical about as he is. I do like Ice T though. I love him on Special Victims Unit.